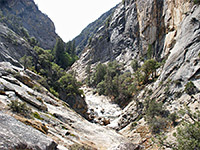 Along with the loop around Zumwalt Meadows, the Roaring River Falls Trail is one of only two short paths in the Cedar Grove district of Kings Canyon, so most visitors make the hike; a 5 minute stroll along a paved, wheelchair-accessible footpath to a powerful waterfall, actually the last in a sequence of cascades as the river drops by 200 feet at the lower end of a deep, narrow, granite gorge. Most of the falls are not visible from the trail but can be seen by scrambling further upstream, beyond the end of the official path. Although particularly turbulent in early summer when the snows are melting, the river carries a considerable amount of water all year. 8 views of Roaring River Falls. The well marked trailhead is beside a small picnic area on the south side of Kings Canyon Road, 3 miles from Cedar Grove. The path enters a belt of trees and meets the west end of the River Trail, which follows close to the Kings River through generally wooded land, past Zumwalt Meadows and on to a junction with the Bubbs Creek Trail. 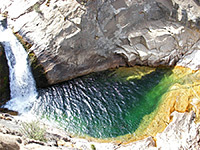 The main Roaring River path climbs 40 feet over 0.2 miles and ends at a viewpoint next to a circular pool beneath the lowest falls, where the waters emerge from a curving, V-shaped granite chute. The pool is usually deep enough for swimming though the water is very cold, the site is in shadow for most of the day, and at some times of year the current will be too fast. 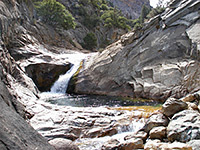 The upper section of the falls may be reached by climbing up the hillside to the left, initially through trees then over an open rockface, ascending about 150 feet before the slope on the west side lessens sufficiently to allow a descent back to water level. This part of the river has three main falls with two deep pools between, and upstream are many more cascades, though it seems the cliffs become too steep to progress very much further along the canyon. Warning signs at the end of the path discourage any off-trail hiking.